Glamorgan captain Jacques Rudolph says batsman Chris Cooke deserves "all the accolades" after a record-breaking win over Kent in the One-Day Cup. Cooke hit 94 runs off just 54 balls as Glamorgan passed their target of 318 with two balls to spare on Tuesday. It was the county's highest run-chase to win a limited overs game in Cardiff. "Chris Cooke was amazing, he's done it for us so many times over the last two years so all the accolades should go his way," Rudolph told BBC Wales Sport. Cooke's innings came at the end of a run-filled day as Kent's Darren Stevens scored 110 off only 64 balls to help set Glamorgan a daunting 50-over target. Colin Ingram's first Glamorgan century kept the home side in the match in reply, but they still needed 103 off the last eight overs. A heavy shower then made life more difficult for the Kent bowlers, while Cooke also survived being caught off what subsequently proved to be a no-ball following a review. 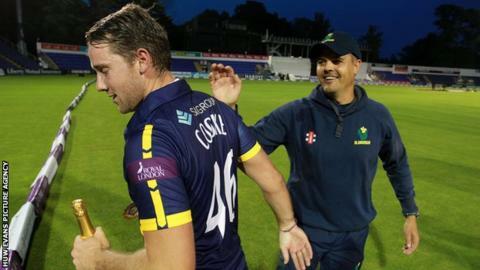 "Personally it's a great feeling to contribute to a win like that for Glamorgan, chasing over 300 is a great team effort and we all played our part," Cooke told BBC Wales Sport. "It was a hell of an effort from Colin Ingram up top to lay the platform for the big sloggers to come in at the end. "The rain break actually helped us. David Lloyd came in and played a brilliant cameo and that got the ball moving, after that I thought it was on." Glamorgan, whose first game in Group B was a washout against Nottinghamshire, now have one point after overcoming their two-point deduction for a poor pitch last season. Over the next six days, they have two more games in Cardiff against Essex on Friday before hosting Hampshire on Sunday, travelling to Birmingham on Monday and then a home game against Sussex on Wednesday. "For this first week we want to give it our best shot and see where we are on Sunday, but I think that sort of win will give us quite a lot of momentum on Friday," said Rudolph. Cooke added: "The schedule's a bit crazy but it has been for the last couple of seasons and it's the same for everyone so we just need to get on with it." Glamorgan hope to have Graham Wagg available for the Essex match after the all-rounder missed the first two games due to concussion.